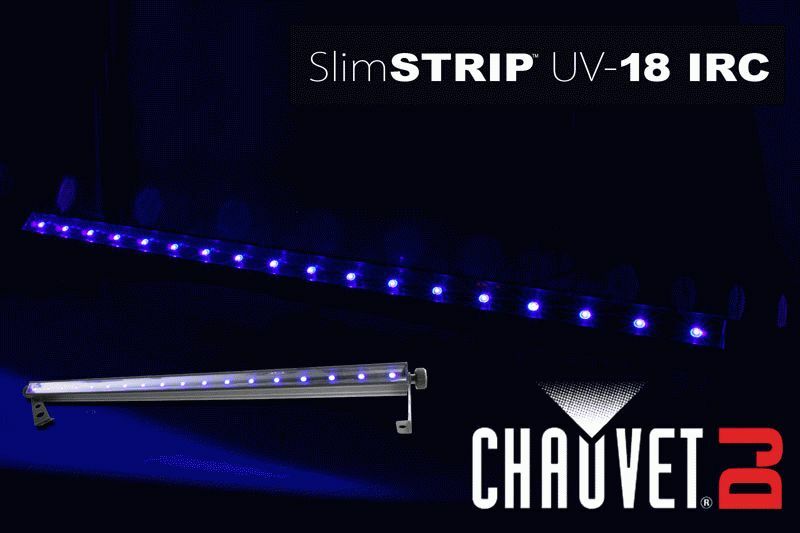 CHAUVET DJ has brought more green (and more mobility) to UV lighting with the new SlimSTRIP UV-18 IRC. Powered by 18 3-watt LEDs, this high-output ultraviolet wash is an eco-friendly alternative to standard 48-inch fluorescent tube UV fixtures. Producing a bright UV glow that surpasses those of traditional fixtures, the SlimSTRIP UV-18 IRC also brings a new level of mobility to ultraviolet lighting. The new wash fixture can be operated remotely with the optional CHAUVET DJ IRC-6 Remote (sold separately) in addition to being run with DMX control. The SlimSTRIP UV-18 IRC lends itself to creating massive UV displays at dances, clubs, parties and “black light” themed events. Up to 34 units at 230V and 17 units at 120 V can be attached using CBB-6 mounting brackets. The units can be power linked without requiring extension cords. With a strobe rate of 0 to 33Hz, a coverage angle of 160° and a wavelength of 390 to 400 nm, the SlimSTRIP UV-18 IRC has the performance features needed to make a powerful impact in large UV displays. 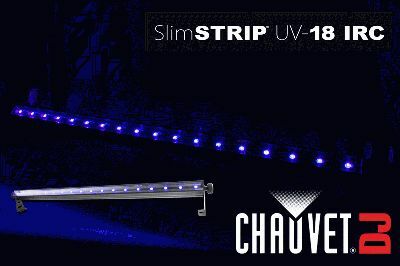 A plug and play fixture, the SlimSTRIP UV-18 IRC is ready to use right out of the box. Weight 5.2 lbs. (2.4 kg) and measuring 41.9 x 2.3 x 5 in (1,065 x 60 x 126 mm), the compact fixture fits neatly into the CHS-60 VIP Gear Bag for worry-free transport. Like all LED fixtures, the new SlimSTRIP UV-18 IRC has a low power draw, low heat emission and long lamp life, making it the ideal choice for DJs looking for a bright, mobile and earth friendly UV fixture to add to their creative tool chest.